State improvement plan for Beach Road is set for construction next year, but selectmen and townspeople remain divided. Tisbury selectmen voted 2-1 Tuesday night to send a letter to the Massachusetts Department of Transportation opposing the Beach Road improvement plan as it is now designed. The vote caps months of debate at the town level over details in the state plan, especially a shared-used bicycle and pedestrian path running from the Tisbury Marketplace to Wind’s Up. 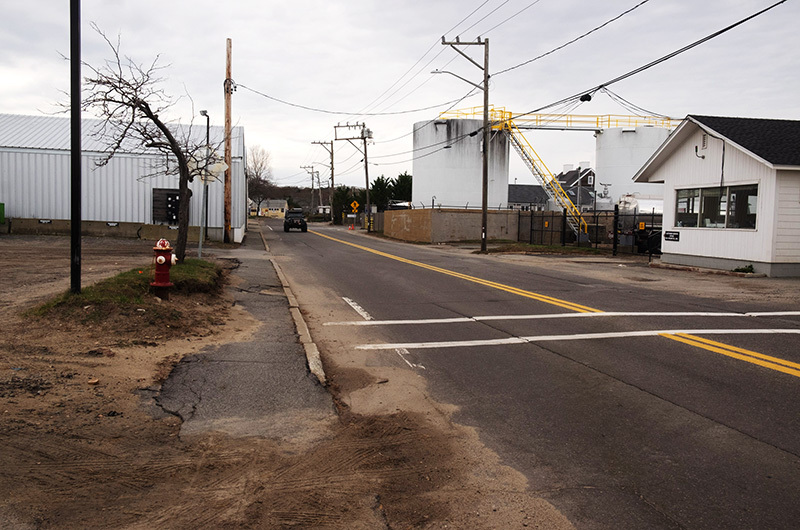 With the $5 million improvement project well past the public hearing and final design stage, eminent domain proceedings underway and construction tentatively set to begin next year, it’s unclear whether Mass DOT will consider significant changes. But selectmen decided to send the letter anyway. Selectman Melinda Loberg cast the dissenting vote. “You’re making a terrible mistake,” Mrs. Loberg said after the vote was taken. The letter, written by chairman Tristan Israel and addressed to Mass DOT project manager Thomas Currier, expresses frustration with the state for perceived lack of responsiveness to past selectmen comments, and cites a laundry list of problems. “There are issues concerning drainage, beach nourishment, wires and utility layout, cross walks and lighting which have not been addressed in a manner the town can support,” the letter says in part. Selectman James Rogers, who was on the fence about whether to endorse the letter, agreed to add his support in order to find a compromise plan that limits the amount of property taken by eminent domain. “I think this letter makes the point that we’re not ready yet,” he said. Mrs. Loberg said she was concerned that intervention by the town could jeopardize millions in state funding for the project. “I think we are really in danger of saying to them, take the money you would spend on this project and take it to some other community who has a project that’s ready and use it,” she said. The state owns the road. In an email to the Gazette Wednesday, a spokesman for Mass DOT said the state would continue to work with the town. “MassDOT will continue to work with Tisbury officials concerning the design for improvements to a section of Beach Road,” Jacquelyn Goddard wrote. The area was identified as a missing link in Island bike and pedestrian trail access by the Martha’s Vineyard Commission in 2009. Since 2014, the town has been in talks with the state about improvements. Work was meant to be underway by 2017, but was delayed due to environmental permitting complications. In other business Tuesday, Tisbury police chief Mark Saloio told selectmen that he is looking to restructure the department due to low staffing. He said overtime pay is well over budget, a situation he called unacceptable, and said the department needs to bring on at least two more full-time officers. Eight officers currently make up the police department with another two officers in the police academy, Chief Saloio said. He said some shifts have been reduced from three to two officers. The chief, who began work four weeks ago, said he is also working on updating department policies to reflect best practices and is working on a field training program to better prepare officers for the summer rush. Selectmen gave the chief an unconditional vote of confidence. Town administrator Jay Grande said the town has exceeded its cap for waste disposal at the Greater New Bedford Regional Refuse Management District. The town currently holds contracts with Bruno’s Waste Management for waste removal and Crapo Hill Landfill in New Bedford for waste disposal. Mr. Grande said the landfill is nearly at capacity and increased tonnage from Tisbury and Oak Bluffs is putting a strain on the facility. Selectmen agreed to speak with Bruno’s management and consider hiring a consultant to develop a solution and a new strategic plan for dealing with municipal waste. Selectmen also agreed to set up a meeting with the Martha’s Vineyard Land Bank to discuss the use of expanded Lake Tashmoo beachfront off Herring Creek Road purchased by the land bank last month. George Balco, a member of the Department of Public Works Tisbury advisory board, read off a list of concerns, including the need for more lifeguards, parking, road maintenance and a public bathroom. Mr. Israel and Mr. Rogers agreed that they would like to see confirmation from the land bank that the beach will be available for public use. “I’m in the dark as to what their plans are,” said Mr. Israel. The board approved several holiday festivities coming in December organized by the Vineyard Haven Business Association. A special First Friday is set for Dec. 7 and will include pop-up shops, music and a food truck. Holiday hayrides will be offered on Dec. 9 and Dec. 17 in Vineyard Haven from 11 a.m. to 2 p.m.